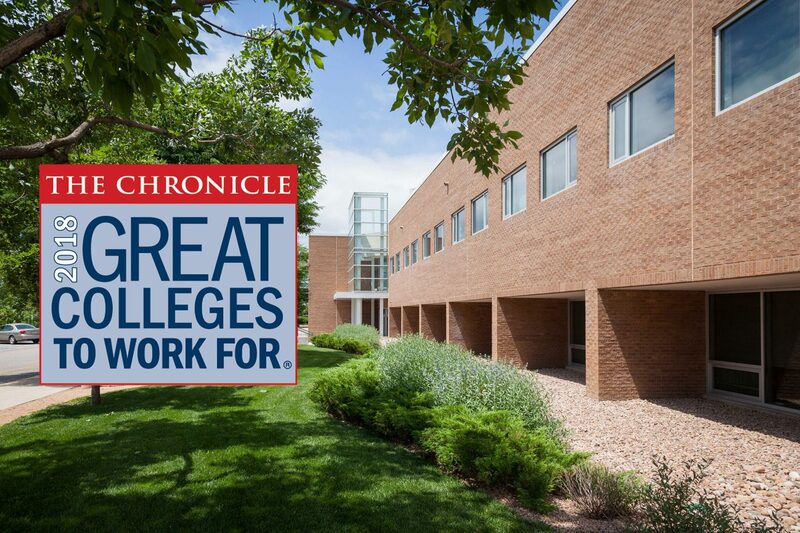 UCCS earned recognition as one of 60 four-year institutions across the United States as one of the “Great Colleges to Work For” in 2018 by The Chronicle of Higher Education. UCCS was the only four-year school named to the list in Colorado and one of 19 in the nation with an enrollment greater than 10,000 students. UCCS was recognized as one of the top 10 institutions in the nation for its teaching environment, compensation and benefits, respect and appreciation, and tenure clarity and process. It’s the first time UCCS has earned recognition by The Chronicle in the 11-year history of its “Great College to Work For” program. The information was gathered by ModernThink LLC, which collected more than 53,000 responses from 253 institutions. A random sample was submitted by each participating institution from a mix of administration, faculty, exempt professional staff and nonexempt staff. The survey included 60 questions on a five-point scale. The university was recognized as one of the “Best Workplaces” in El Paso County in 2017 by the Gazette and the Colorado Springs Chamber of Commerce and Economic Development Corporation. UCCS placed third among organizations with 299 or more employees. So pleased my grandson attends there and his father as well. So nice to good news on colleges these days. It would be interesting to collect students’ responses (both undergraduate and graduate) for a survey like this to see how similar or different the student employees’ responses are from the faculty/admin. I imagine the students have a different experience and perspective than admin & faculty do about working on this campus. As a faculty member who was not interviewed for this study, when it comes to valuing diversity and the inclusion of historically underrepresented social identity groups (especially people of color) I would give UCCS a failing grade. I wonder how many domestic people of color and white women were sampled in this study? I think surveying these groups would produce a very different outcome. We have only a few African American faculty, and almost no curriculum on LatinX studies taught by domestic LatinX faculty, inexcusable in a region where Latina/os are the largest group of color.